The relationship between expertise and understandings of teacher professionalism is considered. The balance between the autonomy and regulation of both teachers and the teaching profession is discussed. Consideration is then given to how different constructions of teacher professionalism may impede or foster teacher expertise. Two binaries are examined: ‘old’ and ‘new’ professionalism and ‘occupational’ and organisational’ professionalism alongside recent calls for reprofessionalisation. The role of teacher organisations, specifically teacher unions and professional councils is discussed. Both types of organisations are positioned as the ‘voice of the profession’ and potentially contribute to teacher development and the recognition of teacher expertise. Asia Society. (2011). Improving Teacher Quality Around the World: The International Summit on the Teaching Profession. New York: Asia Society. http://asiasociety.org/files/lwtw-teachersummitreport0611.pdf. Asia Society. (2012). Teaching and Leadership for the Twenty-First Century: The 2012 International Summit on the Teaching Profession. New York: Asia Society. http://asiasociety.org/files/lwtw-teachersummitreport0611.pdf. Bascia, N. (2003). Triage or Tapestry? 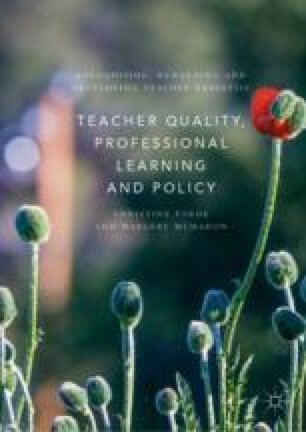 Teacher Unions’ Work Toward Improving Teacher Quality in an Era of Systemic Reform: A Research Report. Washington: University of Washington, Center for the Study of Teaching and Policy. https://www.education.uw.edu/ctp/teaching-and-policy. Education International. (2011). Principal Aims. Brussels: EI. https://ei-ie.org/en/detail_page/4360/principal-aims. General Teaching Council Northern Ireland. (2017). Self-Regulation: An Overview. Belfast: GTCNI. https://www.gtcni.org.uk/publications/uploads/document/GTC_Self%20Regulation.pdf. Hargreaves, A., & O’Connor, M. T. (2017). Collaborative Professionalism World Innovation Summit for Education (The Wise Report). Boston: Boston College. https://www.wise-qatar.org/sites/default/files/rr.12.2017_boston.pdf. Ingvarson, L., Anderson, M., Gronn, P., & Jackson, A. (2006). Standards for School Leadership: A Critical Review of the Literature. Sydney, Australia: ACER. https://research.acer.edu.au/teaching_standards/3. Naylor, C. (2002). Reconciling Teacher Unionism’s Disparate Identities: A View from the Field (BCTF Research Report). British Columbia, Canada: BCTF. http://bctf.ca/error.aspx?aspxerrorpath=/publications/ResearchReports.aspxandid=5576. Scottish Government. (2017a). Education Governance Next Steps: Empowering Teachers, Parents and Communities to Achieve Excellence and Equity in Education for Our Children. Edinburgh: Scottish Government. http://www.gov.scot/Resource/0052/00521038.pdf. Scottish Government. (2017b). 2018 National Improvement Framework and Improvement Plan for Scottish Education. Edinburgh: Scottish Government. http://www.gov.scot/Resource/0052/00528872.pdf.